How fast time moves. The onesie days are all but over and already I'm having a difficult time recalling these early days. So thankful for these little notes to self. 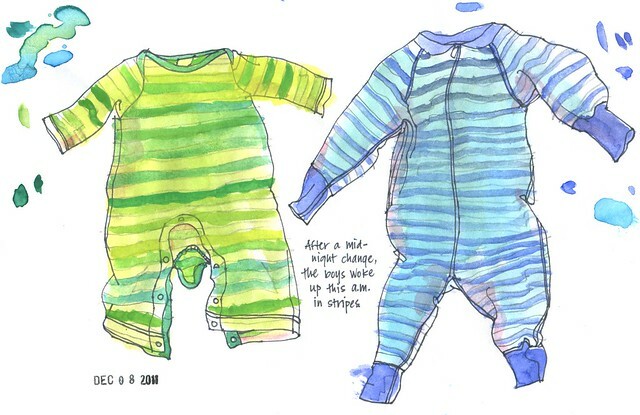 Très croquants ces babygros ! Your sketches are wonderful ... you are so very talented. Martine Alison, Lotti and Annie---Thank you so much for your kind words! Annie--happy birthday to your sweet boy! Oh, this is so sweet. I've been wishing I'd been making notes like this over the past few years. i guess there's no time like the present to start. I've been surprised at how much I don't remember from recent years (as compared to the details I can recall further back) and I'm pretty sure it's because I just don't have the time to contemplate and form memories. I need to start writing stuff down before it goes away!